Spray two or three baking sheets with cooking spray. Press biscuits into 6- inch rounds; place on baking sheets. 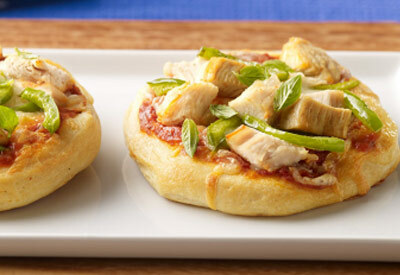 Top biscuits with pizza sauce, 1 cup cheese, turkey, bell pepper and remaining 1 cup cheese. Bake 10 to 15 minutes or until bottoms are golden brown and cheese is bubbly.